We are huge fans of a good tipple here at The Urban List. 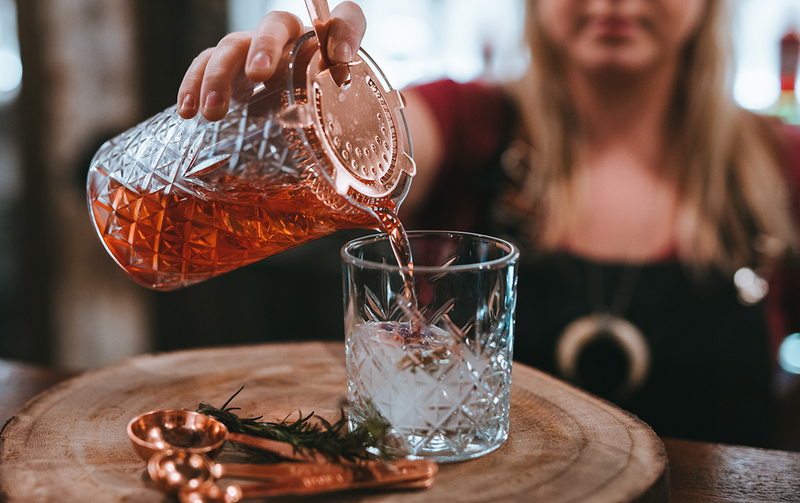 Be it a craft beer, an infused spirit, a crisp wine or a delish cocktail, if there’s a good drink to be had, we want to know about it and (most importantly) we want to down it. Which is why we’re seriously pumped about the Coast’s newest addition, The Gin Parlour & Infusion Bar. The gorge new watering hole is brought to us by the uber talented folk at Miami Marketta. Not simply content serving up some of the best noms at their night market, the team have created a stunning space that is pouring some bloody good drinks…but more on that later. The Parlour, which sits at the Avalon Parade end of the market, came about after a trip to the Barossa. While hunting for wine, the Marketta gang stumbled upon some ridiculously good gin distilleries and thought they’d give the spirit world a crack. (And we’re srsly glad they have). 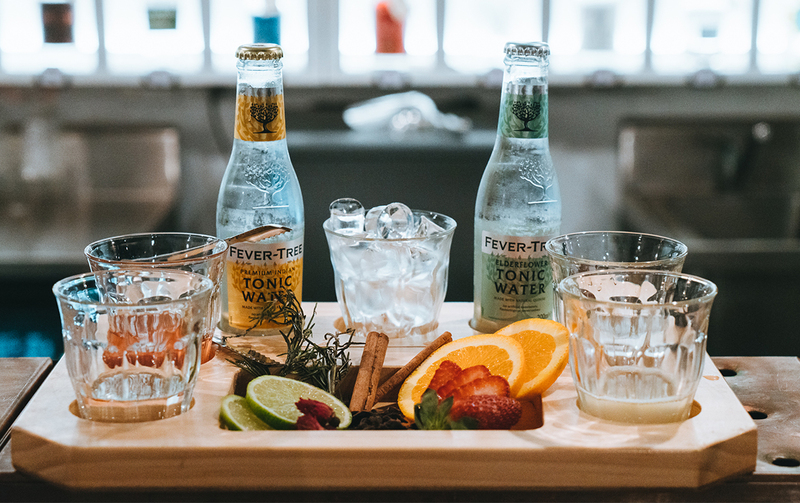 But after MM director, Emma Milikins, got pregnant she realised she wouldn’t be able to taste any of the gin they planned to make, so the parlour was born featuring a lovingly curated list of 90 local and international gins. Hurrah! We’re pretty much obsessed with bar’s gorge fit out. Millikins, an artist herself was inspired by a trip to Spain and a visit to Gaudí’s Sagrada Família church. Each of the 90 gins neatly sit within their own arch on a epic custom-built wall. 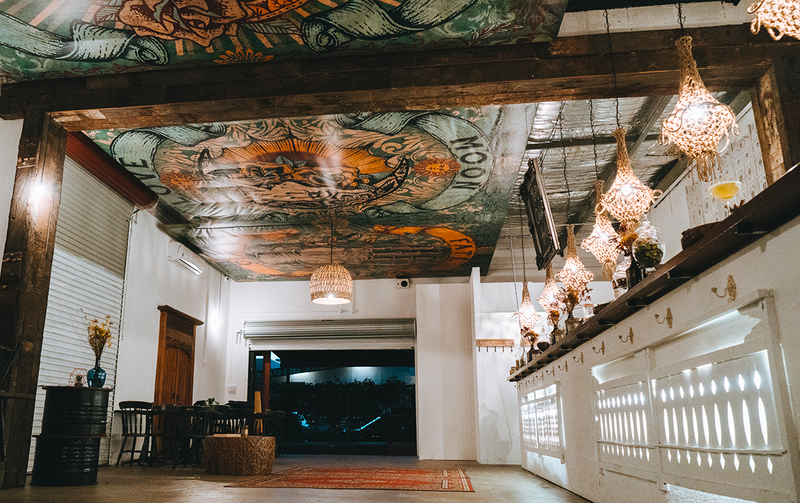 The ceiling is covered in huge 8m x 5m canvases featuring beautiful tarot cards. Did we mention you can book out the space for private events too? Hello achingly cool wedding venue! Among the plethora of gins on offer, there’s local delights like Husk and Brookies as well as sips from distilleries in Tasmania to Adelaide. There’s a concise but oh so tasty cocktail menu too, we recommend the Classic Negroni (which can be done on any gin), the Elderflower and Apple Southside, and a Pink French 75. They’re so good, you’ll never just have one (or two), but no judgement here. Not into gin? (Why? How?) No worries. The crew have you covered with plenty of craft beer, wine and bubbles on offer. But perhaps their most exciting tipple is their house-infused spirits, including vodka, whiskey and tequila. We’re talking creations like whiskey, orange and maple. Our mouths are watering just thinking about it. But this isn’t just a bar guys, not even close. The space, will also be opening as a restaurant exclusively on Thursday nights. That’s right, we’re talking epic drinks AND table service. Not one to do things by halves, there’s even two menus on offer. The Italian Job, aka the crew behind GC institution Bread and Butter, will be serving up all the pizza, pasta and calzone goodness you love them for. And for a little spice in your life, Double T is rolling out a Mexican menu, too. There will also be a jazz band cranking out cool tunes all night long. But if you can’t make it on Thursday, or if you can but just want more (you’re insatiable, we love it!) 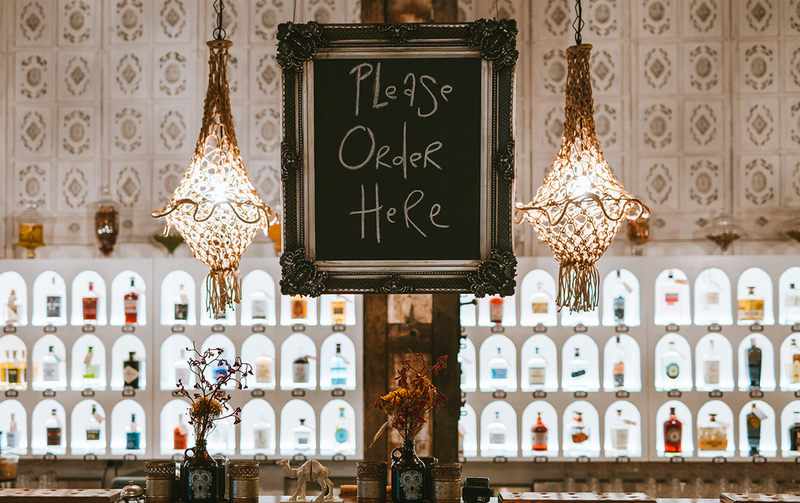 then you’ll be best pleased to know The Gin Parlour & Infusion Bar will also be open and serving up tipples on Fridays and Saturdays when the markets are in full swing. We’ll drink to that! Still thirsty? Why not check out our round up the best local breweries on and around the Gold Coast.